salmon – This Girl Loves to Eat! 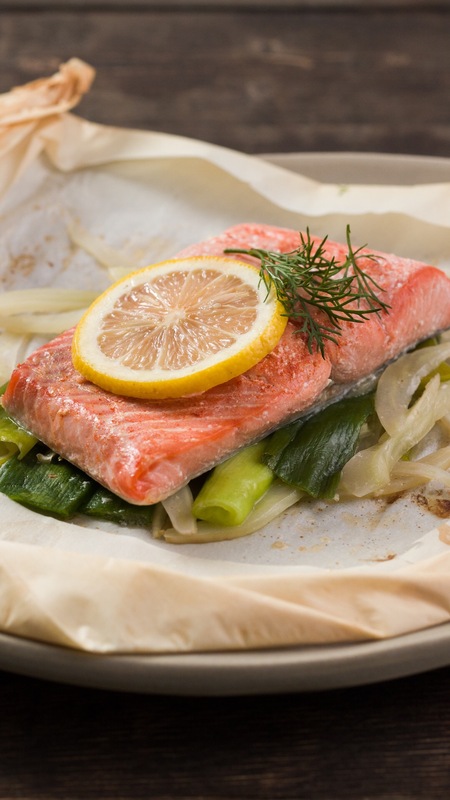 For all of us trying to get more fish, and heart-healthy Omega-3’s, into our diets, this quick and easy recipe from Tastemade (the link takes you to the video – which is handy if you have trouble folding the parchment) takes 15 minutes from prep to cook to table! Fold parchment paper in half and cut out a large heart shape. Fold open the heart. In the middle of the right side of the heart, place 3–4 pieces of scallions and a few pieces of fennel. Place the salmon skin-side down on top of the scallions and fennel. Top salmon with salt, paprika and the lemon slice. Add the pat of butter on top. Fold the heart-shaped paper over the fish until the edges meet. (This means the crease will lift off the table.) Begin overlapping folds from the top left and work your way around to the bottom left, at which point you can twist it or paper clip it. Transfer to a baking sheet and place in oven for 8 minutes, or until meat thermometer reads 140ºF. Serve in the bag on a plate. Toss a salad together while the salmon is baking and you’ve gotten a completely healthy meal on the table in under 30 minutes on a weeknight!